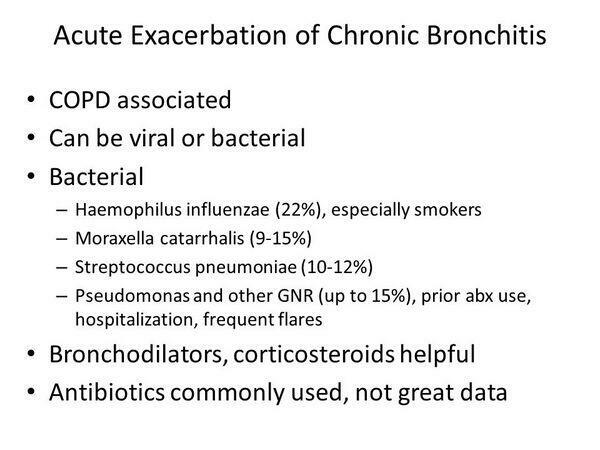 Home > Bronchitis > Pathogens Associated with acute exacerbations of chronic bronchitis. Among episodes of infectious etiology, aerobic gram-positive and gram-negative bacteria (50-75%), atypical pathogens (1-10%), and respiratory viruses (30%) are the primary pathogens associated with acute exacerbations of chronic bronchitis. The relative contribution of these pathogens differs depending on the severity of the underlying airway disease. Approximately 30% of all acute exacerbations are precipitated by respiratory viruses. However, many exacerbations triggered by bacteria are secondary to the viral infection. Clinically, physicians do not differentiate between viral and bacterial causes, owing to a lack of practical viral diagnostics or treatments. Table 1 lists the common pathogens associated with acute exacerbations of chronic bronchitis. Pathogenic bacteria most commonly isolated from sputum during an exacerbation include nontypeable Haemophilus influenza, Streptococcus pneumoniae, and Moraxella catarrhalis. These bacteria are responsible for the majority (70%) of exacerbations caused by infectious agents, with nontypeable Haemophilus influenzae usually isolated twice as often as S. pneumoniae. Atypical organisms such as Mycoplasma pneumoniae and Chlamydia pneumoniae (identified by serology) also play a role in acute exacerbations of chronic bronchitis; these organisms are estimated to be associated with 1-10% and 4-5% of all acute exacerbations of chronic bronchitis , respectively. Haemophilus influenzae H. influenzae, S. pneumoniae, and M. catarrhalis account for 70% of exacerbations. Atypical organisms Mycoplasma pneumoniae Accounts for <10% of exacerbations. Rhinoviruses Accounts for 30% of exacerbations. Additionally, Enterobacteriaceae and Pseudomonas species play an important role in acute exacerbations, chiefly among patients with severe acute exacerbations of chronic obstructive pulmonary disease. TABLE:Dominating Bacteria in Patients with Acute Infective Exacerbations of Chronic Obstructive Pulmonary Disease lists the dominating bacteria isolated from patients with varying stages of lung disease in one acute exacerbations of chronic bronchitis study, where the composition of pathogens differs by chronic bronchitis severity: group 1 bacteria include S. pneumoniae and Staphylococcus; group 2 bacteria include H. influenzae and M. catarrhalis; and group 3 bacteria include Enterobacteriaceae and Pseudomonas species. Haemophilus influenzae. H. influenzae is a commensal organism in the upper respiratory tract. It is the most common cause of acute exacerbations of chronic bronchitis and tends to cause infection when it descends into the lower respiratory tract in patients with underlying respiratory illness, such as acute exacerbations of chronic obstructive pulmonary disease. H. influenzae is a gram-negative bacterium and can also cause pneumonia (infection in the lower respiratory tract). Furthermore, H. influenzae triggers a direct immune reaction in the airways that significantly reduces mucociliary clearance. H. influenzae is isolated in 30-70% of all bacterial exacerbations of chronic bronchitis. H. influenzae is increasingly resistant to several classes of antibiotics such as certain macrolides, fluoroquinolones, cephalosporins, and beta-lactam antibiotics. Moraxella catarrhalis. M. catarrhalis and S. pneumoniae are the next most common isolates; together, they account for another 24-33% of isolates in acute exacerbations of chronic bronchitis. M. catarrhalis causes bronchitis or pneumonia in children and adults with underlying chronic lung disease and is occasionally a cause of bacteremia or meningitis, especially in patients who are immunocompromised. Bacteremia can be complicated by local infections such as osteomyelitis or septic arthritis. M. catarrhalis is also associated with nosocomial infections. Note: Table represents the dominating bacteria recovered in studies of patients with varying lung disease severities. Stages I, II, and III are lung disease severities based on the FEV1 values of the patients. (FEV1 = Forced expiratory volume predicted in one second.) The severity of the airway disease is measured based on the forced expiratory volume, which is the measure (in seconds) of the maximum volume of gas that can be expelled from the lungs during a forced vital capacity test. This test indicates the extent of airway obstruction a patient experiences. A lower FEV is indicative of a higher degree of airway obstruction and greater severity of lung disease. Streptococcus pneumoniae. S. pneumoniae is an important cause of bacterial acute exacerbations of chronic bronchitis (accounting for 15-20% of cases) and other respiratory infections. S. pneumoniae is encased in a polysaccharide capsule that resists phagocytosis by macrophages, so the antibody-dependent killing mechanisms (i.e., complement) are important in the immune system's defense against this organism. S. pneumoniae also contains the enzyme IgAl protease, which cleaves the IgA in the upper respiratory tract and allows the bacterium to survive in that environment. Infection with S. pneumoniae has become an increasing concern over the past two decades because of the rise of penicillin resistance in the community (discussed later). Gram-Negative Bacilli. Common commensal organisms in the gastrointestinal tract, gram-negative bacilli, can cause pulmonary disease when aspirated into the respiratory tract. Conditions that compromise the cough and epiglottic reflexes, such as alcoholism and diabetes, increase the likelihood of aspiration and infection of the bronchi. The most common pathogens in this group are Pseudomonas aeruginosa and Klebsiella pneumoniae. Pseudomonas is particularly notable because it is extremely difficult to treat, owing to its resistance to many antibiotics.